It’s an age-long question no one ever thinks about. But the human race have not been wearing pants for that long. So where did this revolutionary invention that we today take for granted originate and why did it first become popular. One Discovery author believes she can answer those questions. Sarah Scoles believes that a pair of pants found in China’s Tarim Basin in 2014 can tell us much about the history of our practical two-legged pair of clothing. It was unearthed by a team of researchers from the German Archaeological Institute at the Yanghai cemetery. 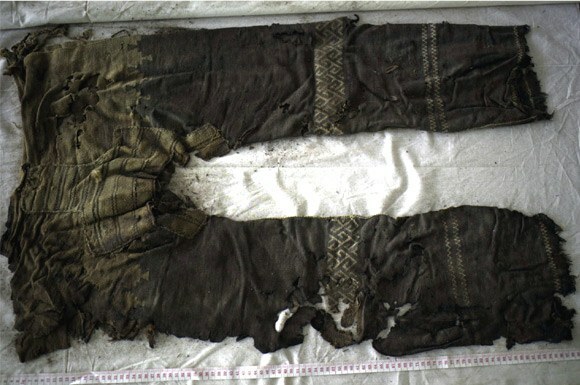 The pair of pants found at Yanghai cemetery. The pair of pants are made from wool and are believed to be more than 3000 years old. While the pants themselves don’t give a way why they were made, several artifacts around them do. Alongside the pair were horse-riding such as a wooden bit, a bow, and an axe. This gives reason to believe that the one who wore them was a person expected to gallop around on a horse all day. By wearing clothes that let each of his feet move independently, it was easier for the wearer to mount his steed without being encumbered by hanging clothing. The Greeks and the Romans eventually picked up on the trend and brought pants to the western parts of the world, which might have been what made them so popular and widely used. Whether these are a pair of the oldest pants or not, one person was wearing leggings long before. The European iceman discovered in 1991, Ötzi, was wearing a pair of leggings made from goatskin. He is believed to have lived some 5300 years ago.